One of the best ways to enjoy the great outdoors is in your very own tent. Sleeping in nature brings with it a unique experience you are simply not able to replicate back home. Investing in a quality tent allows you to do just that. These are affordable options you can travel with, and instant tents make it that much easier to set up, as most can be erected and in place in under a minute (after you’re accustomed with how to put the tent up, of course). However, not all tents offer you the same benefits, so before you go out and purchase a new instant tent, make sure you comb through all the offered benefits. This way you’ll invest in a quality tent best designed for you and your family. An instant tent cuts some of the work out of setting up a tent. With a traditional tent you are forced to unfold the tent, then you must assemble the posts and feed the posts through loops within the canvas. An instant tent cuts this issue out. The poles are already assembled and fed through the necessary loops in the canvas. The poles will then fold in on itself when taking the tent apart. When assembling the tent the full set up will vary some, but the poles will typically lock into place, so all you need to do is raise it out of its carrying case and secure the tent into the ground with the provided stakes (and then add the secondary canvas piece over the exposed poles (when one is provided). So if the worst part about camping for you is setting up the tent, an instant tent takes all of those issues away and makes it a breeze. Most instant tents can go up in a minute or less. We’ve gone through all the pop-up tents that we can find to determine which models are the best for campers everywhere. No matter what size your family may be, we think we’ve found an instant tent that will work for your camping needs. So, check out our reviews below. 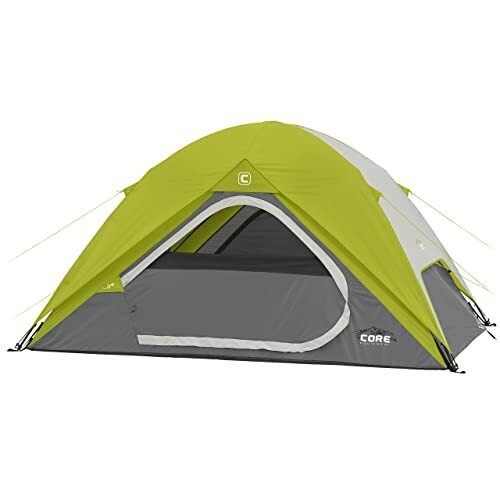 When shopping around for a family tent the Core 6 Person Instant Cabin Tent with Wall Organizer may check off all the boxes. First, it is can be up and ready to go up 60 seconds. This is great if you arrive late at a camp site and have little light to work with, or if it’s raining outside and you want to get inside sooner rather than later. The Core 6 Person Instant Cabin Tent with Wall Organizer has enough room to sleep six (or room for two queen air mattresses). It also has a wall organizer, so if you’d like to partition the tent off into separate rooms you can do that. The center height of the tent is 72 inches six feet), so an averaged height man or woman should be able to stand inside of the tent. 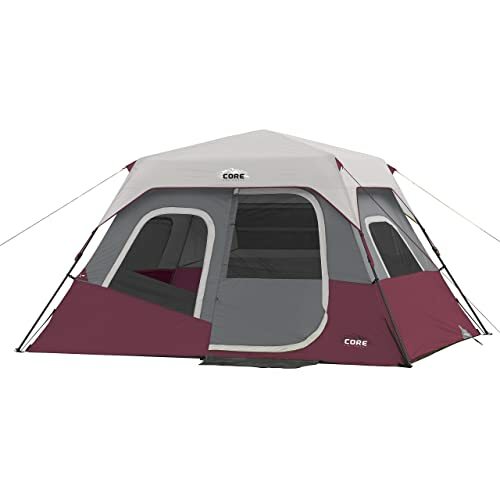 There are a handful of other solid benefits to consider with the Core 6 Person Instant Cabin Tent with Wall Organizer, including a ceiling lantern hook as well as a wall organizer to help keep gear off the floor. This gives you more floor surface space to work with. There is a rain fly designed to go over the top of the tent, which is a much if you camp where it rains. This will help direct rain away from windows, which keeps your tent dry (and prevents water from pooling in the center of the tent and weighing it down). The main benefit of a dome tent, such as the Core 4 Person Instant Dome Tent, is it has a low profile and is easy to put up. In fact, the Core 4 tent can go up in 30 seconds. It also has room to sleep four (room for a single queen air mattress), although there are no partitions. The base of the tent is nine feet by seven feet, so while it can sleep four, it might be a little tight with that many people inside the tent (unless some are small children). The Core 4 Person Instant Dome Tent has a built in lantern hook at the top of the tent, which has a center height of 54 inches (4 feet, 6 inches). There is enough room to sit up comfortably in the tent, but you will not be able to stand up. 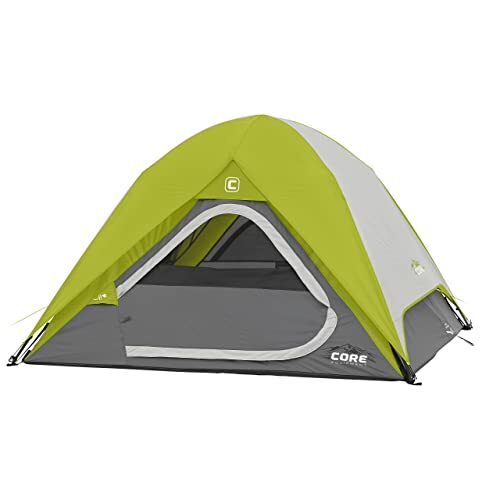 This Core tent does include a rain fly, which directs water away from the tent opening and windows (there is a front door/window and a second window in the rear of the tent). As room inside the tent is somewhat limited, it does feature pockets along the sides of the tent for organization and to help free up some floor space. The rain fly is built with water blocking technology so the water will not stick to the tent and weigh it down. When camping with a larger group the Coleman Cabin Tent with Instant Setup is a solid option to go with. It has space for up to two queen airbeds and can be partitioned into two individual rooms. The tent itself can go up in one minute and has measurements of 10 feet by 9 feet (and has a center ceiling height of six feet). The Coleman Cabin Tent with Instant Setup doesn’t have a top protective layer for the tent, but it does use a vented rainfly that is integrated directly into the main material. This will help direct the water away from the base of the tent while also reducing the amount of material overhead. Some tents with extra canvas on top will pull heat into the tent and make it hotter when in direct sunlight. Instead, the double-thick fabric is long-lasting and made of a polyester mesh and Taffeta 150D material. Ventilated windows are found on each side, which allows for an excellent cross-wind, which is great to help take advantage of any breeze you might have (or to ensure everyone has a view of the camp sight). The Coleman Cabin Tent with Instant Setup also uses a WeatherTec patented system that moves moisture away from under the flooring, which will help keep you dry, no matter how much it’s raining outside. A dual-door opening makes it easy to enter and exit the tent, especially when there are multiple people using the tent. There are also pockets for storing loose items near the windows, although it doesn’t have wider storage units for items like backpacks. The Coleman 8-Person Instant Family Tent is designed to sleep the entire family. It has room to sleep eight and allows you to fit two queen size air beds inside comfortably. It also has measurements of 14 feet by 10 feet with a 6 foot 5 inch center. This way, just about everyone will be able to stand up inside the tent. There is a center wall partition you can set up to split the tent in half, should you want a secondary room inside the tent for privacy. Large screened windows and doors allows in ample light on every side of the tent, which goes up in under a minute and takes just three easy steps. Once you have the provided stakes in place the tent will be secure and ready to go. 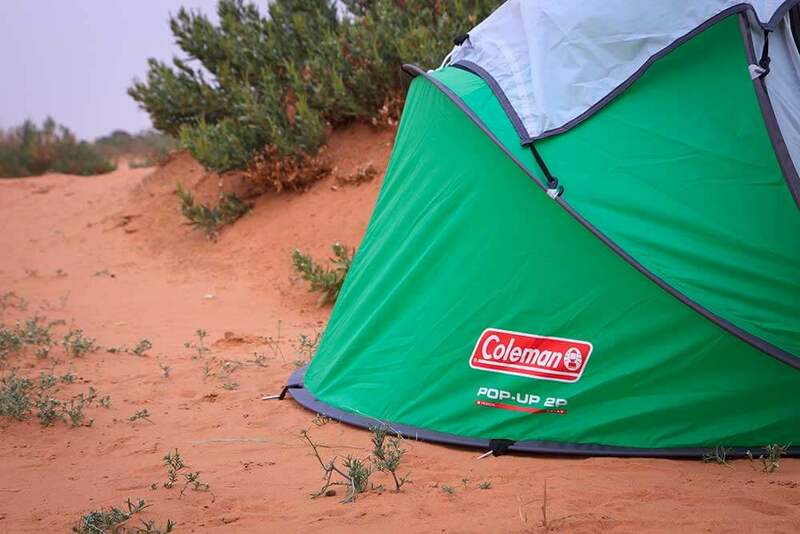 The tent itself uses Coleman’s patented WeatherTec system, which uses an inverted seam system along the floor to prevent moisture from being pulled up into the floor (which is sometimes an issue with other brands). This way, even if it is raining outside or if the ground is damp you can sleep dry and comfortably. There are small hanging compartments by windows that allow for easy storage off of the ground (such as for wallets and sunglasses). All of the windows and doors come with secondary canvas material, allowing you to block out sunlight and wind, while when opened the doors and windows use a screened mesh to keep insects out. 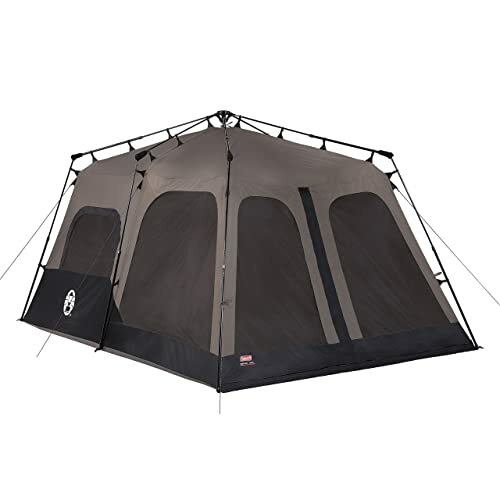 A top canopy does not come with the Coleman 8-Person Instant Family Tent, so if you like to have a secondary protective cover to help direct rainfall you will need to invest in this (Coleman offers canvases that fit on top of all the tents offered by the company). 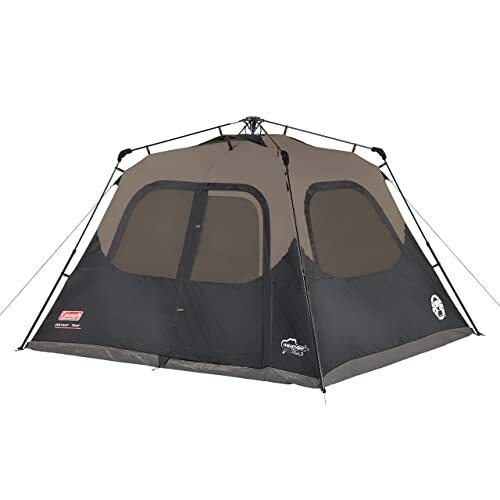 Outside of possibly wanting this secondary protective layer, everything you might need comes in the Coleman 8-Person Instant Family Tent setup. 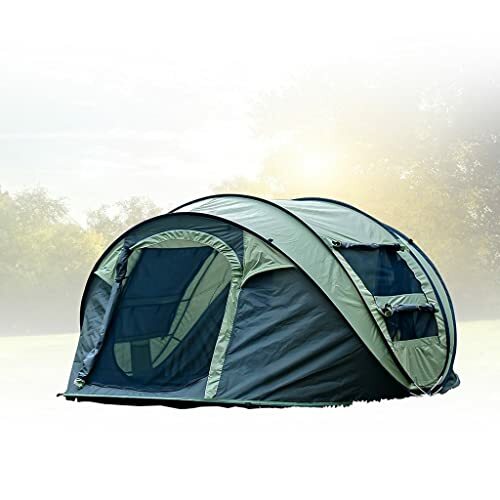 The Core 3 Person Instant Dome Tent is sold as a three person tent, although in reality it is better off for two people (unless a third is a child). It’s amazing how quickly seven feet across split up by three people and camping gear can be taken up. So whether you’re investing in a tent for yourself, for you and a significant other, the Core 3 Person Instant Dome Tent is a solid option that is easy to go up and gives you the kind of features you’d like in a dome tent. There is enough room for a single queen air mattress and there is a center height of 48 inches (four feet), so you should have plenty of room to sit up. There is a lantern hook on the ceiling. You can invest in a camping lantern or even a camping fan. There are also pockets along the interior sides of the tent to help keep items off the ground and dry. These pockets also help free up valuable floor space. While the Core 3 Person Instant Dome Tent does come with a secondary canopy that goes over top the tent it is not required for setup. The top of the tent is vented with open air pockets. The sides are also open mesh vents. This design offers you excellent views of everything around you plus the sky. It is best to use this feature on a clear night when you don’t have neighboring campers (as it is possible to see into the tent from every angle without the top canopy). However, when privacy and rain are not issues this is a great way to really take in the surrounding beauty of nature. The Core 3 Person Instant Dome Tent goes up in 30 seconds. It also has a secondary protective canopy on top, which helps direct water away from openings, which in turn will help keep you dry should it rain. It features two windows, both in the front door and in the rear, so you can take advantage of cross-winds to help cool the interior of the tent. The FiveJoy Instant Popup Camping Tent is designed to sleep between one and three people. This has a rather unique design when compared to most other camping tents as it is almost a half-sphere and doesn’t have any hard angles (it looks almost like an igloo made from canvas). The tent opens up and can be installed in seconds, so you don’t have to fumble around with feeding poles through loops and hooks. All you need to do is pull it out of the carrying case, then secure the edges to the ground with the provided stakes. There is a wide door opening on the front of the FiveJoy Instant Popup Camping Tent, as well as side windows that can be rolled up or down, which give you views not only of the surrounding natural environment but of the sky as well. On the interior of the tent there are storage pockets under the windows, which allows you to safely place loose items and keep these objects off the ground (all while freeing up floor space. These tents come in three different sizes. There is one designed for a single sleeper. This is an excellent choice of you go camping on your own or if you’re backpacking to a secluded destination and want something smaller to slide into your backpack. The larger two and three person instant tents is wider and offers more space. While it can’t be put into a backpack it can be carried over your shoulder or handheld for easy transport.